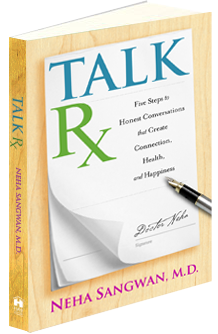 Doctor Neha: Welcome to TalkRx with Doctor Neha. We’re filming in New Zealand, and I have Nina with us today. She’s a brave soul willing to ask her question and talk about communication so that all of you can glean from her experience. Welcome. Doctor Neha: Tell me, what have you been thinking about? Nina: I want to ask a question but it’s not for me, so it’s on behalf of a lot of people. Nina: I’ve lost a few friends to suicide. I know that a lot of that came from fear of communication, particularly in young males. I want to ask, do you have any advice for those who want to support them? I want to support my peers to communicate better so that they can find solutions so that suicide is never an option. Communication could be definitely a solution to this. So what do you think? Doctor Neha: Suicide is a very important topic. I know some people recently who have committed suicide, even as young as 16. The pain that comes from that is so devastating, so thank you for bringing it up. Much of the contributing factor is somebody feeling isolated, lonely, trapped and unable to communicate or feeling like they don’t belong. When we speak of communication, there’s communication with yourself. It’s like the silent voice in your head. Then there’s communication between us, and then there’s communication with something higher than us. My belief is that often when communication breaks down in all three of those realms, someone can feel trapped. They can feel like there’s no way out, right? My big dream is that we start to teach self-awareness of emotions and communication with children in preschool. Nina: Nice. Yeah, I agree. Doctor Neha: The inability to handle emotion or disconnecting from our dreams because we want to belong to something else, or someone else, can easily leave us alone and afraid. Whenever someone makes the choice that it’s easier to exit this world than to be in it, lots of signs have been missed. Nina: Yeah, definitely. So, it’s a side of communication, I guess, that we’re missing out on. Doctor Neha: So how is it that we can reach out and include everyone? How is it that when someone seems silent or not engaged that we might notice that and give away connection? We can ask questions, and be genuinely curious, right? Doctor Neha: For instance, how do we think that smiles are something we have a limited number of? Hugs, they don’t cost anything but we don’t often give them. I wonder, why is it that we’re afraid sometimes to connect on that level? These are just some of my thoughts around how we disconnect or connect. Think about how a parent tells a child, “I love you.” The parent may hug them, provide for them, give them the best education, but they may not actually say the words, “I love you.” Why would we avoid saying that? The need is different for everyone who’s either felt depressed, anxious, or lonely. While you and I may not be able to stop every experience of it, it’s about giving people hope. You are so passionate about this topic. Where do you feel it inside you? Show me. Nina: Right there [at my heart]. Doctor Neha: What does it feel like? Nina: It’s very much based on fear—fear of losing someone, fear of losing someone again. It’s grown from that to be love. I realize that fear will never help anyone, fear is not going to stop [suicide] but love will. I know the impact that love can have, and I know how it’s helped me. I think that what you’re doing about communication is so important, so I want to know how I can expand my tools to support those who are going through issues with communication so that they can express themselves—even if it’s not to me, even if it’s to a counselor, or to whomever they go for help, so that they have the tools when they do decide to communicate. Doctor Neha: All right, so tell me what you do right now. Nina: I’m 18. I left school last year, so I’m having a gap year. Doctor Neha: And you’re trying to figure out what next? Nina: I’m passionate about a lot of things, and I’m just seeing where the future takes me. I’m not too sure but at the moment I’m still in my hometown, which I love. While I’m there I want to do my part to make sure that if there’s anything I can do, that I will do it. Because if not me, who? Nina: If not now, when? Doctor Neha: You’ve given me so much hope for the future. What I would tell you is please listen to this calling. Also did you ever feel like you were at a point where you didn’t feel like you belonged? Doctor Neha: Like you didn’t feel accepted or you didn’t feel heard? Nina: I’ve actually been suicidal myself. I have been at that point, and it was the love of other people and the fact that I was taught a lot of communication skills. That’s what probably helped me, and it was the love that I received from others. So I’m trying to find different ways to communicate love, because some people get uncomfortable when you say, “Hey, I love you,” and they’re like, “We met two days ago.” It’s okay, you just need to share that love because I don’t think we do it enough. I agree. Doctor Neha: Pay attention to these clues. When you do something that heals you, serves others and leads you to the greater picture of the world you want to live in, ding, ding, ding, ding. It’s a clue about where your passion lies, and you’ll never get tired of it. It’ll heal you as you help others and create the world you want to live in. So when people tell you, “You can’t make money at it” or “You can’t do that because X, Y, and Z,” don’t listen to them. Do your passion and the side effect will be that you will have abundance and you will be taken care of. So keep following your heart because you’re on the right track. The answers of how you will solve this will come from what you needed at the time and how you can reach more people. You’re listening to your intuition, which is exactly what I believe gets disconnected. We get disconnected from that intuition. That’s the first step of moving toward a path of loneliness and isolation. So I’m happy to hear that you found your way back home. Doctor Neha: Thank you. So if any of you watching have been concerned about suicide, for yourself or for those you love, ask yourself if you’re coming from fear of losing someone again or fear of losing them at all, or are you coming from love? Love is such a powerful place to heal. Nina, what are your takeaways from our talk just now? Nina: Definitely the disconnect. That’s interesting to hear that when you disconnect from communication you really lose yourself. And listening to your true calling. There’s a lot going on in my head; it’s like scrambled eggs up there. Doctor Neha: It takes time to integrate it. Let it all settle. All right, so I hope this was helpful. It’s an important topic. We’d love to hear your comments on the blog below and if you have a question for me, please drop me a tweet at #askdoctorneha, I look forward to hearing from you. Tap into a time when someone reached out and it made a difference for you. That will get you into your heart space. Then, reach out with compassion and curiosity regarding how you can best support another (rather than assuming you know what he/she needs). Remember, smiles, hugs and words of affirmation are unlimited and free!